The Moon is in Sagittarius until 10:06 AM. The Moon is void until 10:06 AM (since 9:44 PM yesterday). The Moon is in Capricorn from 10:06 AM forward (until Sunday, January 10th, at 3:22 PM). 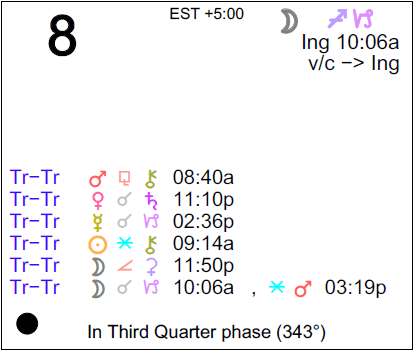 A Last Quarter Moon occurred on the 2nd and a New Moon will occur tomorrow. Mercury is retrograde (Mercury is retrograde from January 5-25). Jupiter turned retrograde yesterday (Jupiter is retrograde from January 7-May 9). These days are excellent for focus and determination in your career, dear Aries. It’s also a good period generally for making necessary changes in relationships with a parent or boss. If there is a negative attitude or bad habit that you need to kick, this may be the time to do so. Patience wins the day, although you could be feeling in no mood to conform to others’ wishes this morning. As the day moves forward, your patience increases. Decisions made today, particularly involving relationships, money, and higher education, tend to be long term and significant, and perhaps quite practical or even overly so. There may be a sobering moment now that pushes you forward. With a New Moon occurring tomorrow, however, this is not necessarily a good time to launch something important to you. Making resolutions is just fine, especially if it’s about taking a hard look at what kinds of attitudes and situations that need to go before moving on. There may be some confusion about a friendship or group alliance this morning, dear Taurus, but if you’re open to learning from others and from your experiences, it’s a good time for understanding and accepting differences, and getting to a better place for it. Being realistic about your financial situation is important now. Whether it’s good or bad, knowing where you stand is empowering; avoiding the issue only serves to undermine you. Know that there are solutions to any problem you face. Consider wise counsel. A loan or mortgage could come through, but whatever does emerge now comes with increased responsibility. There are solutions to problems to be found from circumstances today, and they’re very practical ones. It’s a strong day for applying yourself to something and working solidly. The New Moon tomorrow can alter your focus or goals, but today is strong for realizing what needs to go, particularly related to excess pleasure, in order for you to move forward in a healthier manner. With Venus aligning with Saturn in your opposing sign today, dear Gemini, it’s important to find way to appreciate simple, traditional patterns rather than trying to push for something new. Work on improving trouble areas instead. You might feel caged in, limited, or restricted by others right now, but it’s also a good time for being “in the know”, which is ultimately empowering. A responsibility to or with a partner can be part of the picture now. You’re more able to accept things for what they are, and you may be facing realities about relationships, or experiencing a demand from a significant other. A Sun-Chiron sextile this morning points to a chance to improve a relationship with a boss, parent, or someone in a position of authority. You may be assuming a leadership role in an important area of your life. This morning, you may be getting somewhere with a partner, dear Cancer, particularly related to sharing your goals, ideas, and beliefs. You might learn something new about what someone important to you believes, and while there can be differences that are surprising, you can most certainly learn from them. On the job, show your reliable side. You could be gaining respect for the services you provide or for your responsible attitude. You may have to face a reality regarding a work or health matter, or you could be feeling overburdened or stretched to the limit. However, this is also a time for getting your expectations to a realistic place, and this allows you to better plan your next move. Circumstances occurring now are clearing the way towards more capability in work, health, chores, and routines. Love matters can also strike a serious tone today. While you could feel pressured to make a decision, with a New Moon occurring tomorrow, today is best approached as a time to put something behind you rather than the start of something brand new. This morning can bring some important information to light, dear Leo, particularly related to work and research. You can feel better about yourself for accepting a limitation and moving on to something more deserving of your attention. Be as realistic as possible about what an important person in your life is capable of, as this can help you to trust them more. If you feel the weight of a responsibility now, consider what you are willing to work hard for, or whether the goal is worth the sacrifices. If you allow yourself to be realistic about what a person can or cannot do, feels or does not feel, then you can ultimately put more faith and trust in that person. Loyalty and reliability are qualities that are most important to express right now. A serious discussion or revelation can occur now, and although it can renew your focus, it can also bring quite a bit of dissatisfaction to light in a relationship, particularly a romantic one, or with a creative project. Even so, this is about moving forward – coming to a conclusion and going with it. The day’s energies favor deliberate moves and strategy. It’s not the time to jump into something that you haven’t given much thought to. A New Moon will occur tomorrow, and this can serve to shift your focus. The morning’s events can stimulate the need to accept a situation, or person, for its limitations, dear Virgo, and this can be empowering. In fact, the whole day has a similar theme to it, as we are better off seeing something for its realities, allowing us to adjust our plans accordingly, which leads to a stronger sense of what we can and can’t accomplish. A responsibility or commitment to family might need your attention. While you may be feeling the weight of your responsibilities strongly now, there can be progress made on the home front, and if you are working at or on the home, you are more interested in applying yourself to something that will have value over the long-term. Work done now can be especially fruitful down the road, although brand new beginnings are best saved until after the New Moon that occurs tomorrow. Today is strong for identifying priorities, particularly surrounding affairs of the heart and family matters. Today is strong for recognizing problem areas in your life, dear Libra, and making plans to deal with them. It’s empowering, although a little sobering at first. There may be a reality to face when it comes to a learning or communications endeavor. You might receive or give very practical advice and learn much in the process. Wisdom may be found in traditional methods, and you may be quite focused on finding solutions to long-standing problems. You might receive news of an important learning endeavor, or circumstances may be such that you need to become more organized and efficient with your work and daily life. Transportation or communications issues might change or require special attention. Limits or restrictions may be in order. This is a good time for seeing what areas of life need some slimming down in order to go forward a lighter, freer person. Recent efforts towards restructuring and organizing your life can show signs of paying off today, dear Scorpio. You are exceptionally security-minded at this time, affording you the opportunity to see where you can slim down and eliminate excess in your life, particularly related to finances. This is a day for embracing practical realities, although you might also be facing the cost of extravagances. With self-control and focus, you can make real improvements to your life now and going forward. It’s a good time for taking a hard look at your finances, including any larger purchase you are considering making, with realism. For some of you, a demand or responsibility can emerge in a close partnership. You also have an eye for practical details and sight for situations and objects that will last over the long term. However, with a New Moon occurring tomorrow, it’s best to focus on purging and simplifying than on new commitments. Taking control of your life requires time and energy, and you are in a better position to see what you are willing to sacrifice in order to achieve your goals. With Venus and Saturn in alignment in your own sign today, dear Sagittarius, this is a time for seeing your capabilities realistically, instead of over- or under-estimating them, and this empowers you. With patience, this can improve your chances of success in whatever you set your mind on doing. Some of the tension you have been feeling of late can dissipate as you take a clearer look at things. There could also be an important revelation about your finances, a love relationship, or friendship. Be sure that you don’t assume more responsibility than you should, and while it’s appropriate to take responsibilities on, it’s not about taking on too much. With this Saturnine influence on your sign and Jupiter, your ruler, now retrograde, try not to take yourself too seriously now. A New Moon that occurs tomorrow is likely to shift your focus to building, producing, and acquiring. This morning, good energy is with you for honing communications skills, dear Capricorn. Retrograde Mercury moves into your sign today as well, and this can prompt you to take a closer look at recent projects and your own personal goals in order to improve them. Later today, there may be a reality to face about a dream or fantasy you’ve been entertaining. As a result, you are in the position to know where you stand, making life a little more predictable. You do well with the grounding energy with us today. Personal responsibilities become clear. You can have a stronger understanding of where you stand and a sense of what comes next as a result. You have an eye for what really matters today, and are happier than usual to part with things that you don’t really need. This comes at a good time, as this is the day before a New Moon in your sign. It’s appropriate to focus on letting go of those things that are weighing you down so that you can better use the opportunities that a New Moon in your sign brings to start fresh and turn over a new leaf. With Venus and Saturn aligning in your social sector today, dear Aquarius, you might enjoy coming to the aid of a friend, or following through on a promise. This sector also rules hopes, ideals, and networks. While there may be a reality to face, this is also a time for seeing things more clearly and getting a better sense of what is realizable and worthy of your time and attention. For some, social or romantic opportunities may be found through associates, group associations, friends, and networking. A question of accountability or commitment involving a friend or business goal can be in focus. Be careful that you are not allowing fears get in the way of healthy relations. The chance to improve skills or to learn a subject in a more formal way can emerge for some of you. You might also be learning important things about the past, and possibly discovering a talent or resource that you previously overlooked now. This morning, pay special attention to your relationships with friends, dear Pisces, as friends have something special to reveal or show you. Today, a new responsibility can emerge, or the awareness of one! This can be a pleasant or beneficial one. A boss, parent, or teacher could be leaning on you, looking upon you favorably, or encouraging you to shine. There may be social or romantic opportunities through career and business connections for some of you now. Being conservative, realistic, discreet, and disciplined when it comes to business or public affairs is especially important today. While there may be sobering or serious circumstances today, they clear the path to move forward and to grow. Foundations laid down now can be very enduring. However, avoid beginning an entirely new project today – wait until after the New Moon tomorrow when new information and interests can come to light. 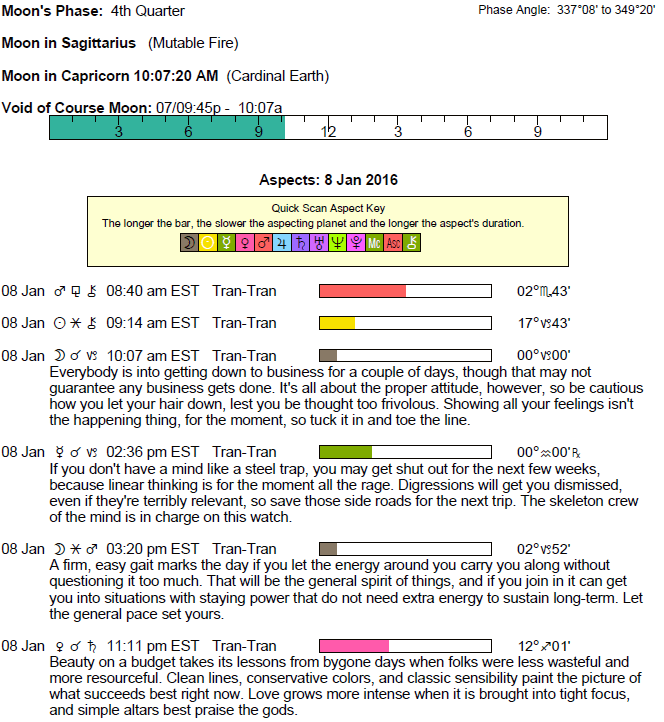 If Your Birthday is January 8th, If Today is Your Birthday full horoscope here. We find it easier to bounce back from criticism, rejection, or feelings of insecurity; to humble ourselves. A spiritual awakening is occuring right now. Note your dreams and innermost thoughts. Enjoy a renewed sense of purpose. Adopt wise and careful thinking. Seek knowledge which carries some authority. Approach new ideas with caution. Plan carefully. This is a time for reassessing friendships and love relationships/partnerships. The same can be true of finances. Weaknesses can be revealed. We might be seeing the less flattering side of people and/or relationships. Love, pain and the whole damn thing! Take the time to heal rifts and direct your energy more positively. The rewards will be bountiful. You feel secure when life is structured, or you are working hard. You may be emotionally distant or cold. You mother’s love may be limited in some way. Your mother may have been strict or cold. You are generous and happy-go-lucky. You enjoy life and popularity. It would be unusual for you to go without comforts in life. You have a tendency to be lazy and self-indulgent. You are philosophical. You easily see the big picture and can talk to people from all walks of life. Your ideas can be uplifting for other people. You have difficulty accepting yourself and other people, and have a tendency to be critical. This may be a result of your own feelings of inadequacy. You need to use your willpower to relax and see things in a lighter fashion. This will help you discover your own inner wisdom. Sabian Symbol: An oriental rug dealer. Sabian Symbol: A big bear sitting down and waving all its paws. Sun 03° Taurus 57' 34"
Moon 06° Capricorn 02' 29"
Mercury 09° Aries 38' 22"
Venus 04° Aries 33' 03"
Mars 15° Gemini 54' 00"